Having a credit card is great, but you have to be responsible with it. With how easy it is to use it for every purchase, it’s important to discipline yourself to use it only when necessary. Here are four tips for using your credit card to help you utilize your card the best you can. You should use cash or your debit card as often as you can to make sure you stay within your means. These forms of payment are taken out right away, so you have to stay within your budget. Little transactions can add up quickly on a credit card, and before you know it, you have a big payment to make. A good rule to follow is if the purchase is under $20, use cash or debit. Make a payment every month, even if it’s only the minimum payment or enough to get your balance below 30% of your credit limit. Although, you should try to pay it in full if you are able to. Skipping a payment, however, is bad news for your credit, and should never be an option. If you struggle to remember to make your credit card payments on time, you can always set up auto pay. This way the payments will go out automatically each month. When you start using your credit card for a shopping spree, you can quickly get carried away. If you let yourself get carried away, your balance will get out of hand fast. Limiting credit card spending to only things you need will help you keep your budget under control. 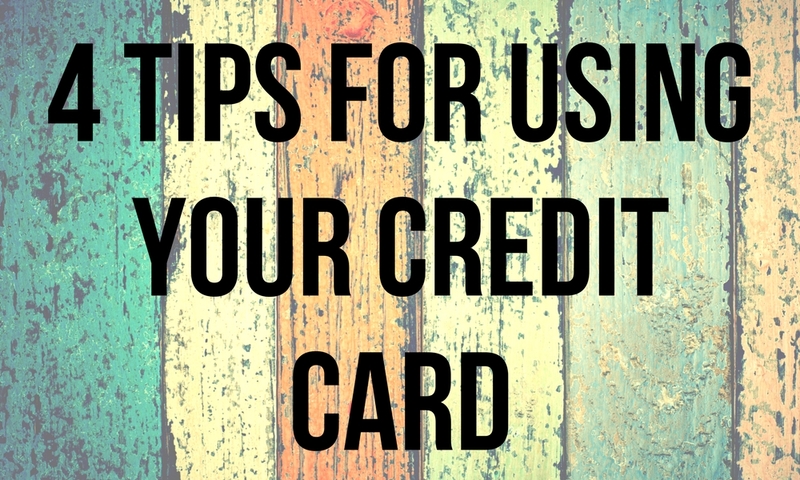 Do you have any other tips for using your credit card that you would like to share? Leave them in the comments! We’d love to hear them!